I Rode the Entire Metro in One Day. This Is What I Learned. It’s a misty Monday morning in Los Angeles, and I’m boarding the Expo Line at Jefferson and La Cienega, headed for downtown. The simplest of acts, the sort of urban interaction I was raised to take for granted, and yet at this time, in this city, I keep thinking of it as revolutionary. I have been a Metro rider since I moved here from New York in 1991; the development of the system—mixing light-rail with a subway—has often felt to me like a promise, or a dream. 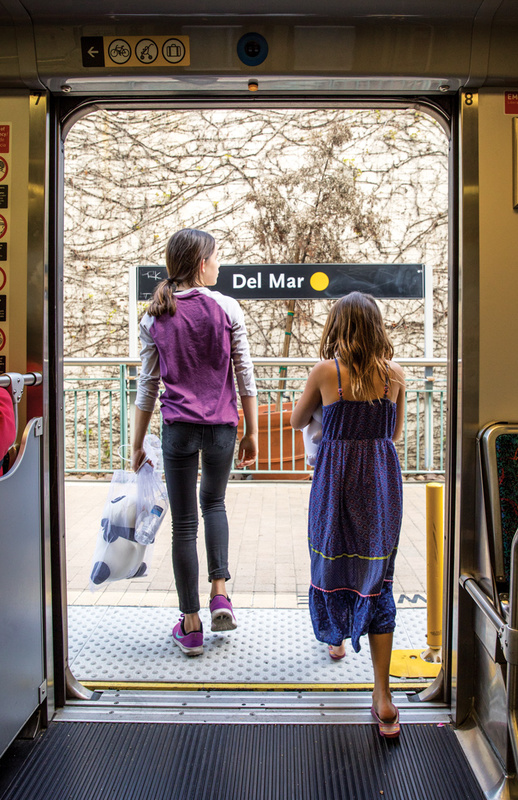 Once, a decade or so ago, not long after my son’s tenth birthday, he and I spent a morning and an afternoon trying to ride every mile of rail in the system: Koreatown to Sierra Madre to Long Beach. It was hard back then to imagine that such a scrim of rail lines would amount to much. This was before the Expo Line, before the Gold Line extension into East Los Angeles or to Azusa on the northeast end. This was despite our decision in the middle of the excursion to skip the Green Line, that the Red and Purple, Blue and Gold had offered us enough. Part of the impetus for our ride was to prove a private point: How big, how expansive could the network be if one could cover it in a single day? Today the question lingers, although we live in a different city, a city re-conceptualizing itself. Los Angeles is famously a city of the car, an “autopia,” to borrow from Reyner Banham’s 1971 book, Los Angeles: The Architecture of Four Ecologies. But what happens when the car becomes unworkable, not only as a unit of transport but also as a social signifier? How many routes do we keep in our memories or our navigation systems, ways of getting around at various hours of the day? How many times have we found ourselves in gridlock: on the freeway, yes, and on the most unlikely streets? On the train none of that matters—not for the moment, anyway. As I take a seat in the middle car, I watch a high school student do her homework, periodically scrolling a finger down her phone. A row or two back, a woman fixes her makeup; a man in a dress shirt, holding a computer bag, dozes and wakes at each station stop. Banham wrote about the freeways as a social landscape. “[A]s the car in front turned down the off-ramp of the San Diego freeway,” he remembered, “the girl beside the driver pulled down the sun-visor and used the mirror on the back of it to tidy her hair.” What I’m seeing here is a different version of the same. It’s early in the morning; we are all setting out on our weeks together, in a space that is both shared and individual. If the woman Banham described is a manifestation of one sort of Los Angeles experience, then this is another. To sleep, to read, to do your makeup—what’s most compelling is how familiar it appears. As it happens, those hundred years are right in front of me this morning, visible from the next stop at Expo/Crenshaw. The platform is full, and behind the waiting passengers, a banner (“Building 8 New Shiny Metro Stations”) highlights one of Metro’s most anticipated projects: the Crenshaw/LAX Line, an eight-and-a-half-mile light-rail spur that passes through Leimert Park and Inglewood before connecting with the Green Line and the LAX people mover scheduled to open in 2019. I lean forward in my seat, trying to peer into the construction site. It’s enormous—a full city block. The street is “decked” with slabs of temporary roadway covering the underground construction, and there are concrete barriers at the sidewalk’s edge. A block or so south of the station, Metro’s Crenshaw office occupies a deep corner storefront, where on a different Monday I meet Matt Gallagher, senior director for construction management. A burly man in jeans and a plaid shirt, he greets me with a handshake and a smile. 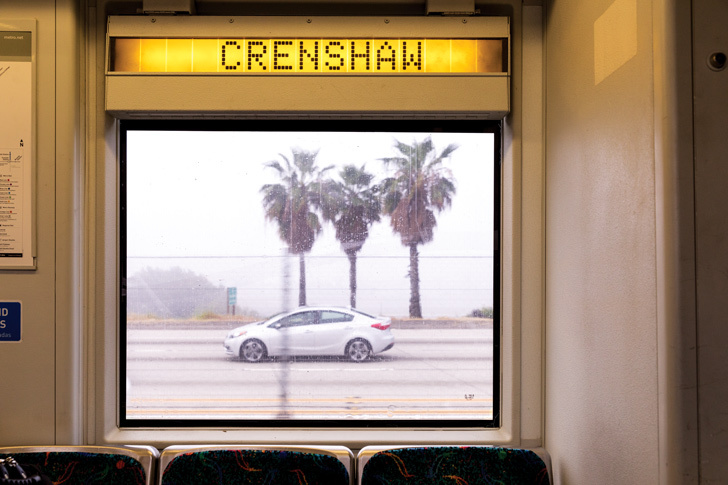 Equanimity is a requirement for the Crenshaw Line. “This is the most complicated project in the system,” Gallagher says. He’s referring in part to the construction, which involves bridges and subway tunneling as well as street-grade tracks and stations. But the project also encompasses three Los Angeles council districts, the cities of Inglewood and El Segundo, and community and business interests, among them the Baldwin Hills Crenshaw Plaza Mall, which will have a direct entrance to the station at Martin Luther King Jr. Boulevard. 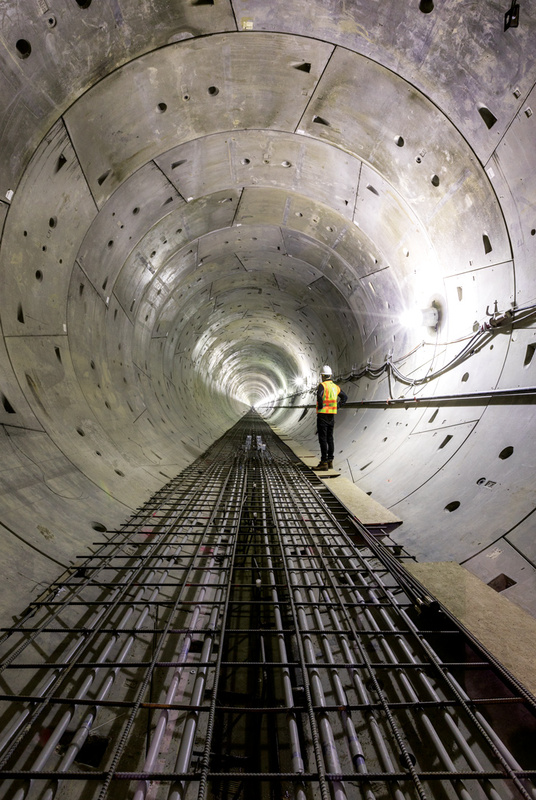 The station box is exactly what it sounds like—an enormous rectangular chamber, 800 by 100 feet, carved 60 feet into the ground. 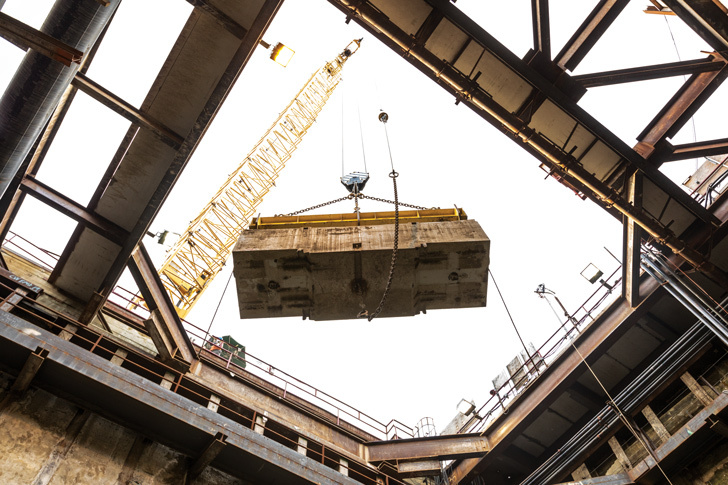 Hanging from the unfinished ceiling above us, braces support utility and sewer lines; at the edges of the space, steel piles and rebar frame triple-concrete walls. Although we’re well below the surface of Los Angeles, there is no feeling of claustrophobia, no sense that we are observing the city from beneath its skin of streets. At the south end of the box, one of two 1.7-mile tunnels to Leimert Park has been completed, a thin stream of water sluicing where the tracks will be installed; the other is getting under way. I am witnessing something we almost never look at: a city as it is being built. Whatever else the system signifies, it is a massive infrastructure project, on the order of the freeways or the aqueduct. 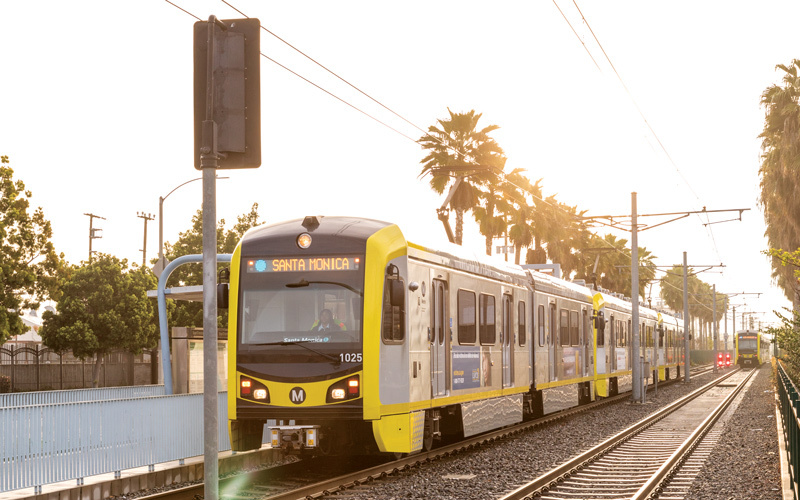 Both of those innovations changed, even created, Los Angeles, much as Metro Rail will do. In my neighborhood, apartment and commercial complexes are going up in anticipation of the Purple Line extension along Wilshire to La Brea, Fairfax, and La Cienega; here a similar impulse is at work. In December the county Board of Supervisors reviewed a recommendation to partner with Metro on developing three parcels, including what is presently the construction staging lot at Crenshaw and Rodeo. A century ago, of course, development was spurred by rail expansion, too; communities across the region grew as stations were built. Now Metro is reusing some of those discarded corridors (the Yellow Car once traveled down Crenshaw, and the Expo Line repurposes an old Red Car right-of-way) while asking us to imagine another city, a version of Los Angeles we have not seen before. As we pass through Inglewood—the route runs west on Florence, with a station at La Brea, in the heart of downtown—Gallagher conjectures about a spur that might run a mile south on Prairie to the stadium being built for the Rams and Chargers. Crossing the 405, he points out the rail bridge that stretches above the freeway and La Cienega. “You can’t shut down La Cienega for a train every seven minutes,” he insists with pride. “That’s unacceptable.” At LAX he shows me where the elevated people mover is projected to open in 2023. The idea is to create a transit hub for buses and rail that will be “bigger than Rosa Parks,” he says, referring to Wilmington’s Willowbrook/Rosa Parks station, where Metro has its main Rail Operations Center and where a number of bus routes intersect with the Green and Blue lines. People who work for Metro call the Blue Line “the mother of all lines.” That’s because it is the oldest in the system. It opened in 1990, and the trains show their wear. In addition, the Blue Line’s safety record is among the worst of any light-rail line in the United States, with more than 1,000 train collisions and 120 crash-related deaths over the past 27 years. I’m not thinking about that, however, as I exit the Expo Line at 7th Street/Metro Center on my daylong ride and wait to transfer. Instead I’m captivated by the scene. This is precisely what Gallagher envisions for the Crenshaw extension, a platform thick with humanity at the peak of morning, students and office workers mostly, homeless and some tourists walking through. Everywhere is noise and chatter, an edge of critical mass, the city rising around us and above. Of all the Metro stations, Metro Center may be the most fully urban. It’s underground, for one thing, with multiple lines and transfer points: the Red and Purple lines beneath the Blue and Expo. 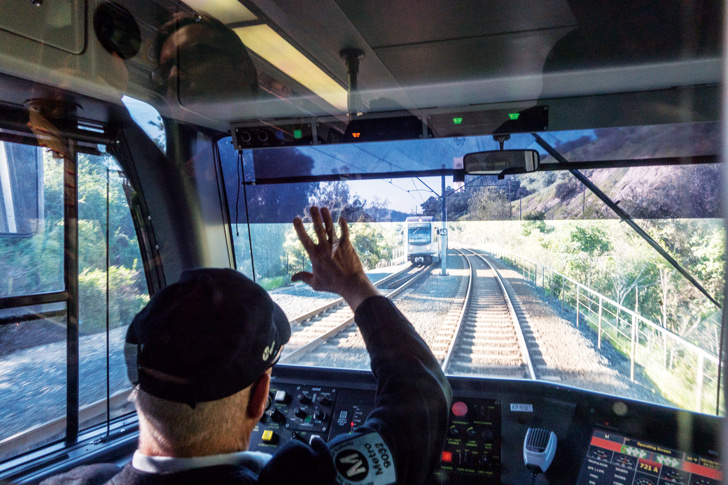 “Access is big for us,” Philip Washington told me one midmorning last spring as we rode the Expo Line during a “sneak peek” of the Santa Monica extension. He was talking primarily about fares, which at $1.75 per ride are lower than those of any comparable system in the United States. But if you want to frame accessibility in broader terms, you could do worse than to start right here. Emerging from the tunnel at Metro Center and moving south in the middle of a downtown street feels like traveling through both space and time. Whenever it makes that sweeping curve from Flower onto Washington, I have the sense that I’ve been dropped into the Los Angeles of 70 years ago. Partly the sensation has to do with the line’s deep roots: The Red Car put its route here into service in 1903. But even more, it’s the city itself. This area of downtown remains something of a no man’s land, too isolated yet to gentrify. Many buildings look as they did in 1949, when Billy Graham brought his Los Angeles Crusade to a revival tent at the corner of Washington and Hill. The texture is beyond mere pavement, and it is echoed by the screeching of the train against the tracks. Still, watching the communities as they pass—South Los Angeles, Vernon, Watts—offers a view of how the region fits together: Southern California as mosaic rather than elusive sprawl. One knock on the place has long been that its streets are little more than conduits, which is why mobility remains encoded as a civic goal. Yet in an era of terminal gridlock, we have no option but to think again. “The implications are really interesting,” Christopher Hawthorne, the Los Angeles Times architecture critic, once told me. “We think of the city in terms of neighborhoods and divisions because it’s too difficult to get around.” But if that’s true—and I believe it is—it’s also the case that each neighborhood has a personality. Look at the Florence Street station, a park and ride, with Roosevelt Park and a Dodgers Dreamfield across the street. Look at 103rd Street/Watts Towers, where the Towers shimmer to the southeast, a filigree of spirals piercing the morning haze. Los Angeles can be difficult to recognize, but to traverse it by train, station to station, is to understand it as self-contained. At Willowbrook/Rosa Parks, I transfer to the Green Line, which uses an elevated set of tracks along the 105. A sheriff’s deputy asks for my TAP card, the first time I’ve been checked in more than 20 years. Willowbrook/Rosa Parks may be a key transit hub, but it is dilapidated, dark and noisy, in the shadow of the freeway. More than a hundred felonies, including rapes and robberies, were reported annually here from 2012 to 2014. Waiting for the deputy to check my card, I twinge, anxious I haven’t tapped correctly; I’ve always found the fare system balky, with all its tapping and re-tapping—counterintuitive and unnecessarily complex. The deputy scans my card on a handheld device and allows me to pass. On the Green Line homeless sleep in the front car. At the Mariposa station a woman in a motorized wheelchair dozes on the platform as commuters squeeze past; at Aviation/LAX half a dozen people board with rolling travel bags and settle among my fellow passengers—working people, mostly Latino and African American. As traffic inches along the 105, riders talk in low voices and look at their phones. There is nothing to see, nothing to look at, nothing to do except wait until our stations come around. In 1993, on the day the Red Line opened, I spent a couple of hours riding back and forth on what was then a 4.4-mile loop. Five stops, Union Station to Westlake/Mac-Arthur Park and back—it barely felt as if it scratched the surface of the city. And yet here I am, nearly a quarter century later, riding the Purple Line to Wilshire/Western before doubling back to take the Red Line to North Hollywood. Sitting in a cluster behind me, a mother chats with three grown sons while rocking a baby in a carriage; they get off at MacArthur Park. Beneath the vaulted ceiling of the Wilshire/Vermont station, a man sleeps on a bench, and the air is tinged with urine and weed. If the Blue Line serves a large African American ridership, here I encounter more Asians and Latinos. These changes are subtler from car to car; on the train each station stop creates a shift in dynamics, interplay. At Sunset and Vermont a group of people in scrubs boards from Children’s Hospital and Kaiser Permanente. A street musician wearing jeans and a tank top waits, guitar in a soft case on his back, to exit at Hollywood and Vine. What we’re experiencing is a shadow geography, the demand that we engage, or interpret, the city via what we encounter on the train. Back in the day, Metro sought to bake that in by commissioning artists to give each station a signature appearance: hanging light sculptures at Pershing Square, a nighttime sky of dark blue film reels at Hollywood and Vine. Many of those details have disappeared, and what remains appears vestigial, of some other age. Perhaps the only station where the art seems resonant is Universal City: The platform features a memorial to nearby Campo de Cahuenga, where in 1847 the Treaty of Cahuenga was signed by John C. Frémont and Andrés Pico, ending the Mexican-American War. That subterranean monument is one of my favorite landmarks, emblematic of the city’s fraught relationship with history. It’s also oddly fitting because Los Angles is a city where history is often beneath the street. Last November a 10,000-year-old elephant skull fragment was discovered at the Purple Line’s Wilshire/La Brea station construction site. Nine months earlier an ancient bison bone was dug up at Leimert Park. “We have archaeologists on call,” Matt Gallagher tells me. “They assess the findings, and work continues around them.” That’s a different kind of history than, say, the young man on the platform in North Hollywood wearing a USC baseball cap, a T-shirt, and gym shorts, but there’s a way it all connects. In a different era he might have ridden the Red Car or taken the 101 to the 110. Today it’s Metro: a straight shot, 13 stops with only one transfer, Red Line to 7th and Metro, Expo to USC. Part of why that works is speed, which is one reason I like subways. The Red Line from North Hollywood to Union Station, a distance of 17.4 miles, takes 29 minutes; to travel the Expo Line, at 15.1 miles, requires 44. That’s a matter of economics as much as anything, since the cost of building heavy rail as opposed to light-rail is prohibitive; hence the passage of a 1998 ballot measure that—until 2014, when construction on the Purple Line extension started—shifted funding from subway expansion in favor of light-rail and rapid bus lines. 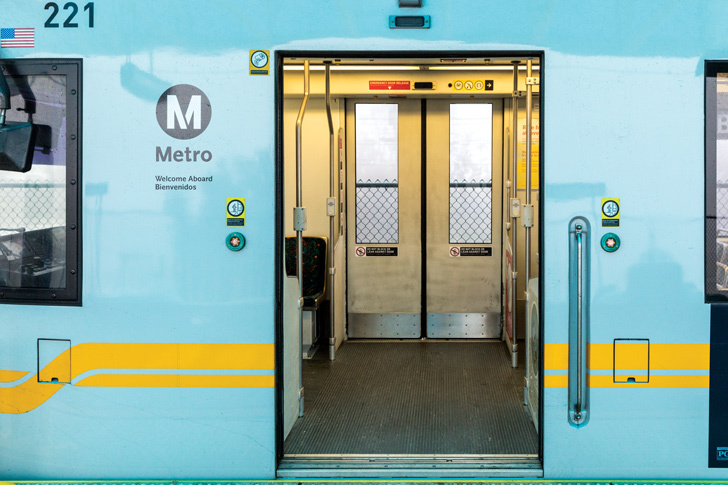 Even Measure M, which passed in the November election, stays relatively clear of subways, focusing on extending light-rail routes such as the Gold and Crenshaw while adding new lines, including one from Union Station to Artesia and a potential conversion of the Valley’s highly successful Orange Line busway to light-rail. (The key to the project is the Sepulveda Pass Transit Corridor, a multilevel tunnel for cars and mass transit that would connect the Van Nuys Metrolink station with the Purple Line and LAX.) What we save in money, however, we repay in time. “The fundamental problem with a lot of the expansions,” suggests historian Nathan Masters, “is that they are too similar to what we had 100 years ago.” He cites the problem of light-rail that runs at street level and must engage with traffic, “which slows the trains to a maddening extent.” Of all the region’s light-rail projects, the tunneling on Crenshaw is one of the few concessions to the frustrations of at-grade crossings. Here we see the city Metro is seeking to reimagine, one in which trains and cars are not in competition with one another so much as they are complementary. “What we have proposed,” Washington told me, “is what I call a balanced transportation system, where the automobile is not the enemy. We are looking to ease congestion. We are not saying we’re going to eliminate congestion completely. But instead of the person getting in their car and driving 20 miles, maybe they’ll drive two miles to our park and ride.” The plan includes integration with bike-share programs, Lyft and Uber, and pedestrian corridors. As the Gold Line train curves east to cross the Los Angeles River, I glimpse one more piece under construction: the Regional Connector, an underground light-rail scheduled to open in 2021, with three downtown stops that will link the Expo, Gold, and Blue lines, so a rider can travel from, say, Azusa to Long Beach or Santa Monica without changing trains. As we pass the station site at 1st and Central, within sight of the Japanese American National Museum, construction mostly makes for occluded streets and concrete barriers. Squint a little, however, and you can almost see it: that double vision of the present and the future asserting itself. From Pico/Aliso we continue to Mariachi Plaza, the symbolic entry point to Boyle Heights and one of two underground stations on the east side of the line. After Soto we emerge on 1st Street, turn south at Indiana and east again on 3rd. We stop at the East L.A. Civic Center, with its Transit Center, Roybal Health Services, library, park, and apartments—as it is doing in Crenshaw, the county Board of Supervisors passed a 2014 ordinance encouraging “transit-supportive development”—before progressing to Atlantic Boulevard, the end of the line. By 4 p.m. I’ve traveled well back in the other direction, the San Gabriel Mountains swelling to the north in scattered sunlight as we roll through Azusa and Monrovia, where new stations have been built beside older derelict ones, a reminder of the history of this right-of-way, which once belonged to the Atchison, Topeka and Santa Fe. Past, present, future—it all overlaps here, at the farthest edges of the rails. Two hours ago I was in North Hollywood; two hours before that, in Redondo Beach. I’ve been to East Los Angeles, nearly Montebello, as well as North Los Angeles, Pasadena, Azusa, and will soon return via downtown to Santa Monica and then Mid City, where I began. It’s a stunt, of course it is, but if my original intent was to prove how small, how contained the system is—could you imagine riding New York, London, Paris in a single day?—the result is turning out to be the opposite, a way of confronting the vastness of the city, both in miles and communities. I feel a sense of wonder, revelation at the scope of the region, but also at how much territory I have been able to cover without a car. It takes me two hours and 14 minutes to travel from Azusa to Santa Monica, a journey that requires three trains. First the Gold Line back to Union Station, then the Red Line to 7th and Metro, where an Expo train sits at the platform as if waiting for me. The trip encapsulates many of the possibilities and the contradictions of the system, not least the movement from suburban to urban and back again. All the way to Santa Monica, I can see this, passing through downtown at rush hour, watching office workers and students make their way home. If the trains were crowded this morning, they are equally crowded now. In front of me a woman reads a novel as a young man with a computer case stands beside her, holding on to the bar above her. At Expo/Vermont a man boards with two girls, who clutch souvenirs from the Natural History Museum. This is what a public transit system ought to look like, how it ought to run. This is how it connects the city, by making room for everyone. As we cross into Santa Monica, we pass Expo’s Santa Monica Yard, Division 14, a state-of-the art facility near Centinela south of Olympic, where trains are serviced and repaired. A little before 6 p.m. the yard is fairly quiet, but that will change in six or seven hours, when the Expo Line begins to wind down for the night. 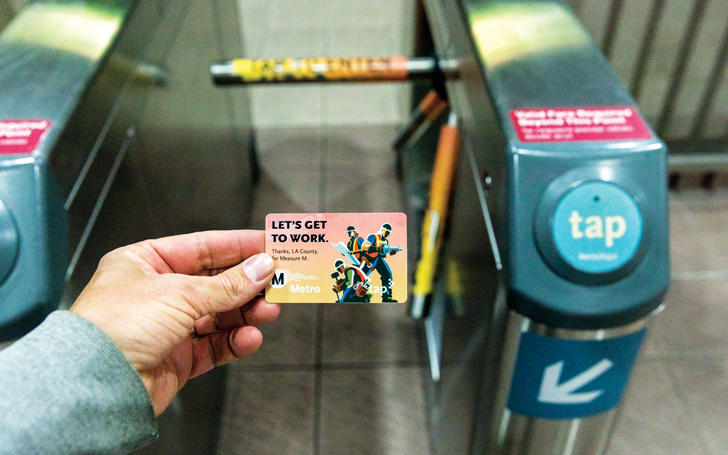 Metro may have official hours of operation—standard service extends from 3:26 a.m. to midnight, later on weekends—but in reality the schedule is a bit more flexible. A few weeks ago, for instance, when I spent what Metro calls the “third shift” at the yard with the overnight manager, John McCarty, the last train came in around 2 a.m., with service resuming at 3:30. Imagine an air traffic controller for the rail yard, and that’s McCarty. He wears sneakers, blue work pants, a Metro necktie, and a ball cap perched back on his scalp. His glasses are square cut, and he worries about his eyes. At his desk, where he stands with a restless stillness, there are six large monitors that provide video surveillance and digital schematics tracing the Expo Line and its trains. One screen breaks the yard down like a game of Tetris, each car represented by a small rectangular icon so McCarty can identify and manipulate them: from the cleaning platform, where they are taken first, to the sidings, where technicians check the brakes and doors, lights and horns. From his perch he can see the yard through a wall of floor-to-ceiling windows, and during the shift he periodically wanders from his desk for visual confirmation, to make sure everything is where he thinks it is. In the rail yard there is always some unexpected issue with which a supervisor must contend. 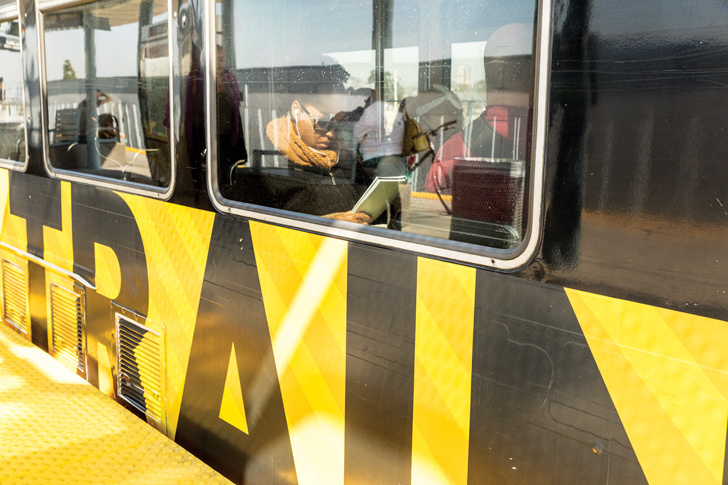 When I visited Metro’s Rail Operations Center in Wilmington, it was a power pole that had come down at the Gold Line’s Del Mar station, requiring the line to be rerouted along one track, alternating trains north and south, and a bus bridge, or shadow service, from Allen Avenue to Highland Park. Tonight it’s short staffing in the shop as well as a blockage in the tunnel near Jefferson/USC, where a car made a wrong turn and ended up traveling more than 600 feet on Metro’s right-of-way. “What’s up with that car? Was he drunk?” an operator asks McCarty later in the shift as the automobile is being cleared. By 3 a.m. the yard is fully active, with virtually every available piece of track in use. “All right, this is the fun time,” McCarty murmurs. “All the children are coming in.” In a break room operators banter over breakfast: the workday as it begins. McCarty calls two operators to his desk and shows them where he wants a pair of cars moved. “Kimberly,” one says to the other, “you eating? I got it. I took my vitamins and said my prayers. I’m good.” Half an hour later, the first trains pull out of the yard, and the drivers go downstairs. I’m thinking about this as my train sweeps by the yard and stops at 26th Street/Bergamot, then rolls down Colorado Avenue. Ahead of us the downtown Santa Monica station rises above the intersection of 4th and Colorado, a few blocks east of the beach. From Azusa to the ocean, from the airport to North Hollywood. From Long Beach to East Los Angeles to the third shift at the rail yard, this is a system that never sleeps. I get off the train and stretch my legs. All day long I have been in motion, but it feels good, for the moment anyway, to have my feet in one place. People are going home or out to dinner, as if it was the most natural thing in the world. Standing there, I imagine a city redefined by such interactions, in which no one will ever have to use a car. David L. Ulin is a 2015 Guggenheim Fellow and the author of Sidewalking: Coming to Terms with Los Angeles, which was shortlisted for the 2016 PEN/Diamonstein-Spievogel Award for the Art of the Essay. Previous articleThe Best Mexican Restaurant in New York Is Coming to L.A.